South Africa is home to some of the most strikingly beautiful vineyards in the world. Those who visit the winegrowing areas of Stellenbosch, Paarl, Franschhoek and beyond seem compelled to take photos almost constantly because every turn reveals a new and dramatic vista. The Western Cape landscape is underlain by very old rocks. To understand what has evolved, let’s simplify the scenario to three basic rock types that frequently appear in Cape vineyards. The Malmesbury Group (a.k.a. Malmesbury shale) is thought to be around 650-750 million years old. Around 550 million years ago, the shale was compressed, deformed and intruded by the Cape Granite, which created a mountain range. Over the next 100 million years, that ancestral mountain range was eroded away and the Table Mountain Group (a.k.a. Table Mountain sandstone) was deposited on top of that relatively flat surface. The sandstone can be up to six thousand feet thick. 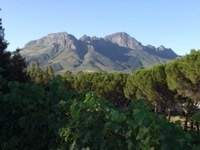 The soaring cliffs, like the Simonsberg, that loom over vineyard areas in Stellenbosch and environs are often composed of sandstones and quartzites of the Table Mountain Group. These sands were deposited during the Ordovician Period, some 450 million years ago. That bit of information is often mentioned in vineyard descriptions, but let’s explore the meaning of it in greater depth. To a geologist, the Ordovician is more than just a time horizon. It also invites inquiry about the state of the earth at that time. The Ordovician world was a very different place. Most of the Earth’s land mass was centered around the South Pole. The precursor of the African continent adjoined the future South American and Antarctic continents as part of the landmass known as Gondwanaland. While the Ordovician seas were teeming with life, the landscape was quite bleak. It’s possible that the first plants were moving onto land, but these would have been algae or other simple forms. The first fossil evidence of vascular plants on Earth does not emerge until 50 million years later. The sands that formed the Table Mountain Group were likely eroded off the barren continent and deposited without inclusion of organic material. The result we see today, after 450 million years of additional erosion, has the hard sandstones of the Table Mountain Group lying on top of either the Cape Granite or Malmesbury Group shales. While all this uplifting and erosion was going on, the African continental plate was separating from the South American plate and drifting northward to its present location. In the process, it has bumped into the European plate and forced the uplift of the Alps, but that is the topic for another column. It is a combination of massive forces that has set the stage for South African viticulture today. The current geographic setting of South Africa is very favorable for quality wine production. At 34-35 degrees south latitude, it is approximately equivalent to the Mediterranean Sea in the Northern Hemisphere. The vineyard area is about 2/3 the size of California, and very diverse in character. The climate here tends to be hot unless there is a moderating element, whether it be altitude, shade from the spectacular mountains, or cool maritime air. The combined influence of the Atlantic and Indian Oceans have a great effect on the weather patterns and storm conditions of the Cape. The cold water Benguela Current off the west coast of southern Africa, combined with the prevailing westerly flow of air currents sets a climatological stage perfect for wine production. The wet marine air drops some of its moisture as it passes above the offshore current, so the oceanic proximity provides a cooling influence without excessive rainfall. This is the same combination of marine air and Mediterranean-like climate that enhances wine quality in the Santa Ynez Valley of southern California, the Valle Central of Chile, and the in the vineyards of Western Australia. The very old geological formations and the long periods of exposure to weathering give the Cape vineyards some of the oldest soils in the world. That comes with its own problems. While vines that struggle to ripen fruit often yield high quality grapes, the weathered soils take that axiom a bit too far. The ancient soils have been leached of nutrients over time and tend toward highly acid pH levels--to a point that impedes root development and growth. The answer for many growers is to plow the soil deeply and add lime to raise the pH to a more balanced level. The distinctive soil types of the Cape, combined with access to cooling marine air, create a diverse environment for grape growing. With experimentation and study, some growers have identified distinctive wine characteristics from the various soil types. In Stellenbosch, Chenin Blanc from sandstone based soils tends toward a livelier, lemony style while vines grown on decomposed granite soils will offer more depth and tropical notes. In Walker Bay, the admirable Pinot Noirs are most often grown on shale-based soils, whereas the sandstone soils are used for livelier white wines. The real geologic picture is far more complex than this. There are many more rock types than the three mentioned here. Plus, the structural faulting and folding along with the ongoing erosion and alluvial processes add many more elements to the complex Cape Winelands puzzle. As South African viticulture evolves, it will be interesting to note the influence its distinctive geologic setting has on its wines.